And the Award for Best Standing Ovation goes to…..
Patent leather shoes, designer bow ties, sequined ball gowns and even a cummerbund were on display at this year’s ProDriver Qsi Awards for the automotive and professional driver industry. But if some of the attire was a bit old school, there was nothing predictable about the emotional nature of the awards ceremony. At Green Tomato Cars, we are happy and humbled to have won our fair share of awards over the years – in the transport industry but equally for innovation, environmental responsibility and our contribution to London more broadly. That’s not to say we don’t still want to win, or that we don’t mind when we get pipped to the post. When it comes to awards…it’s the people that matter most. So it was last Thursday when, after 3 hours of champagne reception, networking, a fancy menu, plenty of vino and lots of awards presented to companies, the real people behind this industry got the recognition they so richly deserved. During all the company awards, the pleasant applause from around the tables was invariably drowned out by the whooping and hollering of the three or four staff from the winning company. 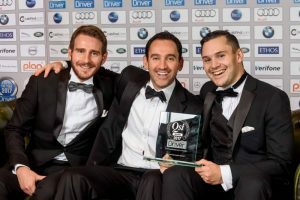 But when it came to the Driver of the Year award – which was so closely contested there were two Bronzes – the room of over 400 people stood as one to cheer and rejoice in the individuals who every day demonstrate so much passion for their profession. 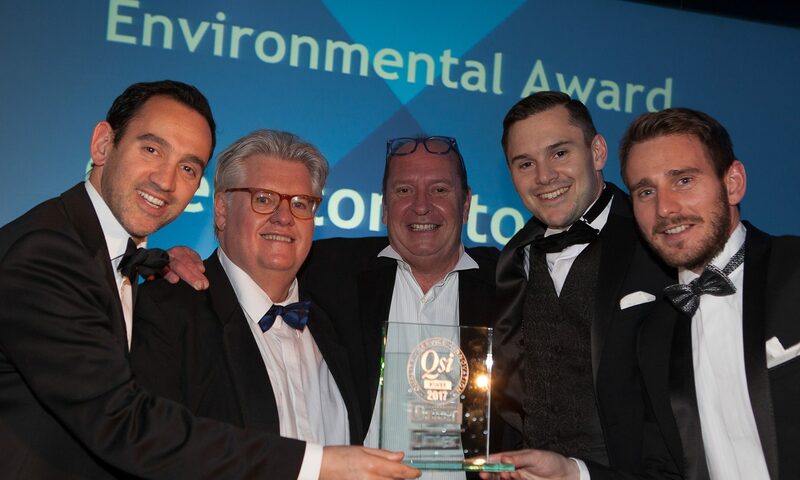 At Green Tomato Cars, we are happy and humbled to have won our fair share of awards over the years – in the transport industry but equally for innovation, environmental responsibility and our contribution to London more broadly. When Simon Peacock, the former soldier who had fought back from the brink after his patrol was hit by an IED in Afghanistan ‘only’ took Silver, you wondered what the winner must have done to get Gold. And as the glamorous presenter told us all about the sterling efforts of the first ever lady to win the award, it was a memorable moment as all of us shared the overwhelming pride that seemed to lift Hilary Hutchinson, from the Lake District, to the stage. And that was just the warm up act. For this year, there was a Special Award. Over the next few minutes, Private Hire turned into Pride of Britain, as Mark Bursa, the editor of ProDriver magazine, reminded us all of that horrific night in Manchester which saw an Ariana Grande concert end in slaughter at the hands of a suicide bomber. As we learned more about the heroic efforts of the management of Street Cars, who told their drivers to forget about money and just do whatever they could to help; and the drivers, who ferried people to hospital all night long, and even went back into the arena to try to assist the rescue effort on site, I can say without doubt this was the most poignant, and most wonderful moment I had ever had the privilege to witness at an awards ceremony. Grown men – and women – from a sector not famed for emotion or sophistication, wiped their eyes. As Gazza’s tears at Italia ’90 softened the face of football, this was the night the minicab industry came together and shed its macho image too. Like buses, ironically, private hire industry awards have a funny habit of coming along in twos. And so it was that the Green Fleet Awards were held at the Ricoh Arena that same evening, and regrettably we couldn’t attend. Imagine our surprise when we received an email the following morning, telling us that we’d won the Gold Award for the Private Hire Company of the Year. While it would have been great to pick up the award in person, I can honestly say I’m glad I was with my colleagues in London to witness the Professional Driver Special Award going to another company. Amid the popularity of hybrid and electric cars, many still do not recognise the edges of the two or understand their differences. So, here is a simple guide explaining both types of car that epitomise the future of the transportation industry! With growing concerns toward climate risks on one hand and sceptical attitude toward existing regional and global environmental treaties, cities around the world have relied more on local intervention programmes and initiatives to address domestic environmental problems. Collaborating with local communities and public-private partnerships, leading cities across the globe have introduced a variety of green initiatives which whilst being context-specific, set examples for other cities which share similar environmental problems and characteristics. With travellers are increasingly concerned of their potential carbon footprint and demand more eco-friendly travel options, this style of travel is now more affordable.